Platform beds are becoming more and more popular, especially as memory foam mattresses become more popular. There are many reasons why people are gravitating toward getting platform beds over box springs and this post will touch on just a few of -them. Platform beds have sturdy slats to support the mattress. Platform beds work better with higher quality mattresses like memory foam, which are also more expensive. However, the extra money you might spend on a higher quality mattress can come from money you would have spent on a box spring mattress. With the strong support of a platform bed, you have no need for a box spring. The slats of a platform mattress are not only there for support but for breathability as well. The slats allow air to flow through the bottom of the mattress and keep it cooler than it would be with a traditional box spring. The slats also ensure that moisture will not build up in the mattress which is essential for a memory foam mattress. 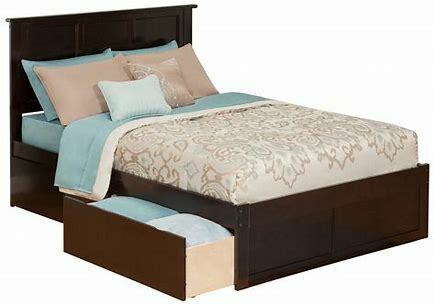 One of the great things about a platform bed is that you can put the space under the bed to good use. Many platform bed designs include drawers underneath the bed. You can have extra furniture storage in your bedroom without taking up any extra space. Platform beds tend to provide more support and be a firmer bed than a traditional bed frame and box spring. This means that the memory foam mattress can work to it’s full potential at providing the correct support for you while you sleep. This can be beneficial for people who have trouble sleeping or suffer from back problems. One benefit of a platform bed that might be unexpected is the feeling that your bedroom is suddenly much bigger. Platform beds have a lower profile which means that it makes the ceiling look higher in the bedroom and then the whole room looks bigger. The bed itself often has a much smaller profile than traditional box spring bed frames which also adds to the feeling of a bigger room. Because platform beds are becoming more popular, they also make the bedroom feel more modern. However, you are not forced to choose a modern design. There are a variety of design styles for platform beds that range from traditional to modern to suit any design style. At Siesta Sleepworks, we offer a wide variety of platform beds, including solid hardwood and solid pine in several different finishes. Some come with drawers or trundles for storage underneath or beside your bed. Stop by our mattress store in Acton, or give us a call today at 978-264-4448 to learn more!